I am developing an internet enabled FM radio for my 3rd year Electronics project. Well, you take the standard FM radio and and connect it to the internet, this allows the radio to get extra content for the user including text and images. It also allows it to push information back to radio stations and other web services. I will be implementing a new technology called RadioDNS. RadioDNS is open technology that lets broadcast radio and the internet work together: enhancing the listener experience, and making radio better. This new technology is based on the DNS system that holds the internet up, allowing you to resolve URIs pointing to online content to support radio listening. By the end of the project, I want to create a usable product that will have some form of user input(s) and of course visual and audio outputs. It will try and be as portable as possible making use of Wi-Fi and/or 3G connectivity, while maintaining main functionalities even when offline. We have 3 lectures next week to give us final details on how the projects run and then I have free reign over what I do then. It has been a few years now and she has served me well, but it is time to say goodbye to dot info. My second personal domain name (first being djvj.eu back in my early teens) has been with us a few years and seen me through my web dev learning process well. It has pointed to some great stuff but now the time is here to say goodbye. I was messing around one day looking for a better domain, I mean dylanjones.info is pretty good as it is a top-level domain with just my name, but then I thought how could I just have my name. I checked that the Spanish .es TLD was publically available outside of Spain. Before 2005, you could only get a .es domain if you held a trademark within Spain or some other naming exceptions. dylanjon.es was already taken and is just a holding page to sell it to the Dylan Jones around the world. Screw that, I am not paying more than neccessary so I looked further into my name. anjon.es was available so I thought, perfect - I can change my name to Ryan and use the sub-domain ry - only joking, dyl.anjon.es is my name. The best bit now is that there are a few other names ending -an Jones so I am willing to give you a free sub-domain and e-mail address if you want it - Just get in touch. So there we go, a personal domain with just my name and if you Ryan Jones, Sian Jones, Brian Jones or Alan Jones etc would like a free sub-domain, drop us a message. A while ago, Alice said something about how the younger generation of today do not wear watches. This may be due to technology we live with in the 21st century, there is an abundance of devices around us reminding us of the time from wall clocks, to microwaves, computers, our phones, music players and TVs; there is just no need to have time strapped to ourselves any more. The concept of attaching a mechanical device to our wrists to keep us informed of how many hours we have left to do things is quite funny really. Why have we been doing this for so long? To know the time, you say, time is precious, we need to look after it. Fair point. But I have taken the plunge and have not been wearing my wristwatch for a couple of weeks and I feel great! At no point have I even looked at my wrist to find out the time. I think I have been on time to my appointments and lectures, for the most part. I feel free and like I have all the time in the world. Looking at my Google Analytics, there was something starring me in the face. 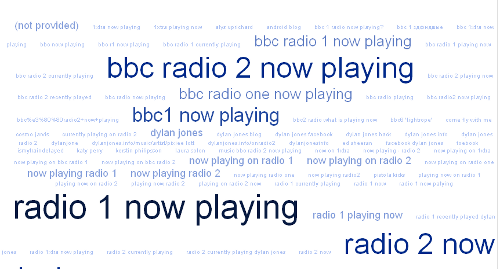 I was aware that my BBC Now Playing application was a bulk of my total traffic, but it was surprising to see how many different ways people will search for what is the current song playing on BBC Radio 1? The other interesting thing is that the most common browser searching for these related terms is Internet Explorer. So I am guessing that the majority of these people are listening to the radio using an Analogue FM radio, rather than via their browser. This is multi-platform radio, sort of working then. A listener is happy to be listening to an old analogue radio and then when wanting track information, will head to a search engine. Great! I hope to add more functionality to the on radio application, including LastFM scrobbling and integration with on-line music stores soon enough.